These wide, versatile tools can be used for spreading Gesso, adhesive and large areas of paint. Using the slit tip decorators gives you the opportunity to experiment with faux finishing and new effects with pastel, oil and acrylic. Colour Shaper Wide is rated 4.8 out of 5 by 5. Rated 5 out of 5 by Anonymous from New to me Using in mixed media art and projects with Grandkids. Easy for kids to use. Rated 4 out of 5 by motobean from Colour shaper is easy to clean The Colour Shaper is great for applying oil paint and moving it around on the canvas. You can apply black paint and then after wiping for a few seconds, you can use the same tool for purest white. 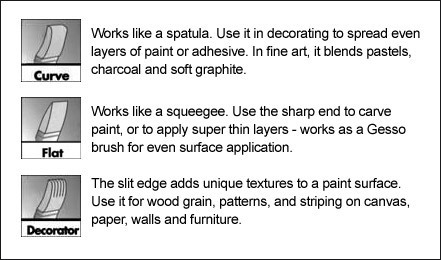 Rated 5 out of 5 by Juniper from Great painting tool I've used Firm and Extra Firm wide Colour Shapers for over 10 years to make large abstract paintings. They are better than brushes for sensitive application of paint, easy to clean, and they don't absorb (waste) paint like brushes do. Rated 5 out of 5 by dancer from Colour Shaper Wide Works great for spreading self leveling gel. Don't know how the leading edge of my curved color shaper developed a tiny nick right in the middle (I've had it for about a year, and take good care of my painting tools). But it prevents a clean, uniform &quot;scrape&quot;. Is it ruined or can it be remedied? This cut or nick in the color shaper is not reparable. You could repurchase the same color shaper to replace this product. We do apologize for any inconvenience this issue might cause you. Please let us know if you have any other questions or concerns. Name:Wide Painting Tool Firm Flat 1"
Name:Wide Painting Tool Firm Flat 1.5"
Name:Wide Painting Tool Firm Curve 1"
Name:Wide Painting Tool Firm Curve 1.5"
Name:Wide Painting Tool Firm Decorator 1"
Name:Wide Painting Tool Firm Decorator 1.5"
Name:Wide Painting Tool Extra Firm Flat 1"
Name:Wide Painting Tool Extra Firm Flat 1.5"
Name:Wide Painting Tool Extra Firm Curve 1.5"
Name:Wide Painting Tool Firm Flat 2"
Name:Wide Painting Tool Firm Flat 2.5"
Name:Wide Painting Tool Firm Curve 2"
Name:Wide Painting Tool Firm Curve 2.5"
Name:Wide Painting Tool Firm Decorator 2"
Name:Wide Painting Tool Firm Decorator 2.5"
Name:Wide Painting Tool Extra Firm Flat 2"
Name:Wide Painting Tool Extra Firm Flat 2.5"
Name:Wide Painting Tool Extra Firm Curve 2"
Name:Wide Painting Tool Extra Firm Curve 2.5"
Name:Wide Painting Tool Firm Flat 3"
Name:Wide Painting Tool Firm Curve 3"
Name:Wide Painting Tool Firm Decorator 3"
Name:Wide Painting Tool Extra Firm Flat 3"
Name:Wide Painting Tool Extra Firm Curve 3"